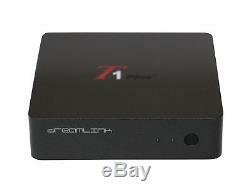 Dreamlink T1 plus IPTV / Android Quad core Set Top Box Receiver Better Mag254. Please note this is the tv box only with no subscription. Dreamlink T1 Plus is the first Smart TV and IPTV set-top box in the market. Download the Latest Kodi from our Market. T1 comes with the latest IPTV/Android exclusive Quad core CPU. We are bringing to you the most optimized Android library for IPTV by DreamTeam with various open Android Apps. Check the supreme Ultra-HD level picture quality compared with other IPTV boxes. Users & Installers friendly Simple GUI interfacing. Dreamlink T1 Plus IPTV Set Top Box Smart TV. Welcome to the future of Android products. The new Dreamlink T1 Plus IPTV Set Top Box Smart TV offers an endless world of entertainment just by connecting it to your TVs HDMI port. The new Google Play Store feature allows you to download countless applications, so you can customize your box. Dreamlink T1 Plus is the first to add the Smart TV to the already well known IPTV set-top box function; making this box incredible versatile and at the same time simple. Sit and enjoy your favourite content from apps such as CraveTV, Shomi, YouTube, Netflix, and more. The new versions of Kodi XBMC are also available through the market place and the Aptoide market place. Never miss a show again. Did you miss a show , movie or sport event? Not problem, just use the Catch Up TV function. The catch up tv option allows you to go back in the Electronic Program Guide (EPG) and play back the show you missed; by adding the advantage that you can now use the video keys to pause, fast forward, rewind and stop. It is like a DVD. As a result, you will be in control of the time you want to use to watch TV. True PVR and time shift. Now you can record and store all the shows you love (including your favourite sport events in 4K) and watch them whenever you want. Finally there is an IPTV box that does PVR. Instant recording and reserved recording. Now you can start a recording with the touch of a button and play back it later, or you can go to the EPG and schedule a recording the same way you will do with a Dreamlink T5. Thanks to this, you can record programs faster and manage your shows easily. This is especially relevant because is very easy to select the show from the guide and hit the recording button than go into a complicated menu to set the recording. Dreamlink T1 Plus comes now with a remote control that also includes a learning key. Consequently you do not have to use a separate remote control for your TV. The learning feature will work with any TV, so you can control the basic functions of your TV with your T1S remote control. Enjoy a huge range of content, including over 2400 free TV channels and movies, sports, games, radio, and more, with the fully optimized channels library from Dream TV pro. Easy set up, just plug it into an HDMI port on your TV, connect it to your WiFi network, and start casting. Dreamlink T1 Plus IPTV Set Top Box Smart TV has super fast channel change opposite to other IPTV boxes as a result of the high speed of the Quad core Mali450 processor. Dreamlink T1 plus and also DOL will update themselves every time there is new software available, as a result you do not have to spend time looking for updates. Your Dreamlink T1 plus contains. Dreamlink T1 Plus IPTV Set Top Box Smart TV Main Features. COMPLIANT WITH ALL KINDS OF STALKER SERVERS AND ALSO EMULATORS. VARIOUS APPS DOWNLOAD FROM DREAM MARKET SERVER, GOOGLE APK STORE AND IN ADDITION THE USB PORT. THE LATEST IPTV/ANDROID EXCLUSIVE QUAD CORE CPU. PROBABLY THE MOST OPTIMIZED ANDROID LIBRARY FOR IPTV BY DREAMTEAM EXPERIENCED AT VARIOUS OPEN ANDROID APPS. EXTERNAL USB SUPPORTING TIME SHIFT AND ALSO LIVE RECORDING OR PLAYBACK. TRUE PVR FEATURES AS TIMESHIFTING, INSTANT RECORDING, AND ALSO RESERVED RECORDING. GOOGLE LOG IN AND IN ADDITION GOOGLE APK STORE FOR ALL KINDS OF APK INSTALLATION. GRID EPG AND SIGNLE EPG SUPPORT MAXIMUM 14 DAYS. CATCH UP TV FEATURE FOR REBROADCASTING CHANNELS IN ADDITION TO NEW PRV FUNCTION. SUPPORTS TV-SERIES CHANNELS AND CHANNEL SEARCH AT VOD MENU. SUPPORTS CHANNEL BUFFERING FOR WEAK SIGNAL CHANNELS FOR LESS FREEZING. SUPREME ULTRA-HD LEVEL PICTURE QUALITY COMPARED WITH OTHER IPTV BOXES. USERS AND ALSO INSTALLERS FRIENDLY SIMPLE GUI INTERFACING. QUAD-CORE ARM CORTEX A7 UP TO 1.5 GHZ DOMINANT FREQUENCY. INTEGRATED MULTIMEDIA ACCELERATION ENGINE NEON. OPENGL ES 2.0(3D VIDEO PROCESSING)/1.1/1.0 OPENVG 1.1 AND ALSO EGL. 264, AVS+, MVC, MPEG2, MPEG4, VC-1, VP6, AND ALSO VP8. POWERFUL COMPATIBILITY THROUGH EMBEDDED ANDROID OS (KITCAT 4.4.2). USB 2.0 DUAL HOST PORTS. MICRO SD CARD SLOT SUPPORT. HDMI VIDEO & ALSO AUDIO OUTPUT. SOFTWARE & ALSO SERVICE DATABASE UPGRADE VIA USB AND IN ADDITION ETHERNET. AS MUSH AS UNDER 0.5W STANDBY POWER CONSUMPTION. ONE SD OUTPUT AND ALSO ONE HD OUTPUT FROM THE SAME SOURCE OR DIFFERENT SOURCES. ON-SCREEN DISPLAY WITH FULL COLOR AND ALSO RESOLUTION. FULL FORMAT 3D VIDEO PROCESSING IN ADDITION TO DISPLAY. LOW NOISE REMOTE CONTROL AND ALSO LEARNING REMOTE. Make sure all of your auctions have ended prior to checking out. Addresses, we are required by State law to collect. Duty Rate is vary subject to different countries' regulation. We value our customers so that if you have a problem we are always here to offer help. We will answer all emails as quickly as possible. Just give us the opportunity to resolve a problem. The item "Dreamlink T1 plus IPTV / Android Quad core Set Top Box Receiver Better Mag254" is in sale since Monday, December 11, 2017. This item is in the category "Consumer Electronics\TV, Video & Home Audio\Internet & Media Streamers". The seller is "bestdeal-usa" and is located in Niagara Falls, New York. This item can be shipped to United States, Canada, United Kingdom, Denmark, Romania, Slovakia, Bulgaria, Czech republic, Finland, Hungary, Latvia, Lithuania, Malta, Estonia, Australia, Greece, Portugal, Cyprus, Slovenia, Japan, China, Sweden, South Korea, Indonesia, Taiwan, South africa, Thailand, Belgium, France, Hong Kong, Ireland, Netherlands, Poland, Spain, Italy, Germany, Austria, Russian federation, Israel, Mexico, New Zealand, Singapore, Switzerland, Norway, Croatia, Brazil, Colombia, Barbados, Bangladesh, Bermuda, Brunei darussalam, Bolivia, Ecuador, Egypt, French guiana, Guernsey, Gibraltar, Guadeloupe, Iceland, Jersey, Jordan, Cambodia, Cayman islands, Liechtenstein, Sri lanka, Luxembourg, Monaco, Macao, Martinique, Maldives, Nicaragua, Oman, Peru, Pakistan, Paraguay, Reunion.